Has Apple made a resolution to release a Retina and non-Retina iPad mini 2? According to the last piece of info we gleaned from the ever-churning Apple rumour mill, the company hadn't decided if it will upgrade its popular iPad mini with a Retina display. In what is admittedly a speculation-raising twist, reports on Friday suggested that Apple will give buyers of the 7.9-inch iPad mini 2 the option of snapping up both Retina and lower-res non-Retina equipped models. In its report, Taiwan's reputable Economic Daily News (via Electronista) has claimed a shortage of Retina display panels means a potential Q4 2013 release has been scrapped in favour of an early 2014 arrival. 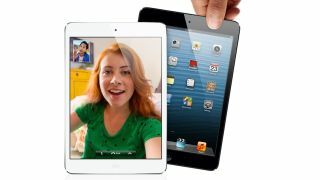 A report from earlier this week suggested that it was the decision over screen resolution itself could cause delays, but either way, it doesn't seem like the iPad mini 2 will arrive much before Christmas. The long-running saga over whether Apple would launch a sequel with a higher resolution display has been going since the day the company initially announced the device in October 2012. The relatively lo-res 1024 x 768 resolution was by far the most criticised feature of an otherwise widely-liked device, which sold by the truckload amid stiff competition from the likes of the Google Nexus 7. Recent speculation has also suggested that the second-gen device would have a faster A6X processor, a touchscreen bezel or even no bezel, and, if a Retina display is on-board, a slightly thicker profile. When will we see the new iPad mini 2 (or 2s), and what features will it/they include? Apple as yet to confirm even a single refresh to its smaller slate let alone a pair, so until we get official word we're sure to hear everything from the plausible to the utterly implausible. That's OK though - at least we'll be entertained. Keep up to speed with the merry-go-round of iPad mini 2 rumours and speculation.